Fox, Richard C.. "Evolution". The Canadian Encyclopedia, 04 March 2015, Historica Canada. 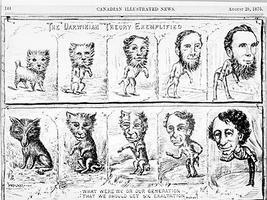 https://www.thecanadianencyclopedia.ca/en/article/evolution. Accessed 22 April 2019. Modern understanding of evolution began in 1859 with publication of Charles Darwin's On the Origin of Species by Means of Natural Selection. 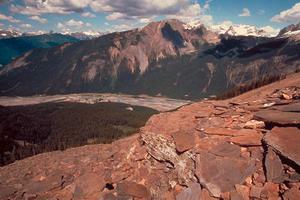 Fossil beds at Mount Stephen, Yoho National Park (photo by Thomas Kitchin). Modern understanding of evolution began in 1859 with publication of Charles Darwin's On the Origin of Species by Means of Natural Selection. In this revolutionary work, Darwin presented an extensive catalogue of evidence to show that all living creatures have descended from ancestors unlike themselves. He also proposed a dynamic, natural mechanism, which he called "natural selection," to explain "descent with modification." The theory of natural selection was developed independently by A.R. Wallace at the same time, and the 2 explanations were presented jointly to the Linnaean Society of London (1858). Throughout the next decades, biologists such as T.H. Huxley improved the theory, defended it from attack by antievolutionists, publicized it and contributed further evidence to it. Three outstanding sources of evidence are discussed below. Creatures have not always been of the same kinds as they are today. Fossil evidence shows that there has been a unique succession of life forms, progressing from simple to complex, and involving groups replacing other groups which, once extinct, never originate again. Fossils in older rocks are less like living organisms than fossils in younger rocks; and groups recognized as being distantly related can be seen to be more and more alike the farther back their fossil ancestors are traced. At local exposures of undisturbed sedimentary rock strata, geologically older fossils occur at lower horizons and younger fossils at higher horizons (eg, at the Burgess Shale Site, BC, and the Dinosaur Provincial Park, Alberta). Some successions allow direct observation of evolutionary change through time, ie, of species giving rise to new and different species directly, through intermediate generations. Organisms of different species show resemblances in anatomy and embryonic development that are inexplicable unless the species are descended from a single ancestral species, different from any descendant. For example, the forelimbs of bats, moles, horses and humans are superficially very different, and function in different ways in accordance with their varying designs. Yet the underlying anatomy and development of forelimb bones, muscles, nerves and blood vessels are the same in all. The differences are only in proportions: forelimb anatomy in each group has been modified, from an original pattern in ancestral mammals, to meet diverse adaptive needs in the descendants. Organisms are distributed geographically according to their relationships, not according to their ecological role; hence similar environments, if widely separated, do not necessarily support similar species. For example, most native Australian mammals are marsupials (they do not develop placentae and young incubate in external pouches), but marsupials do not occur in Africa or southeastern Asia, which have climates similar to that of Australia. Nothing in the climate or geography of Australia suggests that pouches would be especially advantageous there. The diversity of Australian marsupials results from their descent with modification from a primitive, opossumlike ancestor that entered Australia from South America at least 50 million years ago. When land connections between continents were severed, Australian marsupials evolved in isolation, filling niches occupied elsewhere by placental mammals. Marsupials were prevented from dispersing to Africa and Asia by ocean barriers surrounding the island continent. How does evolution happen? Darwin realized, and contemporary evolutionary biology confirms, that natural selection is the major mechanism governing evolutionary change. Because organisms vary, no 2 members of a species (the basic evolutionary unit) are identical. Many variations can be passed, by genetic inheritance, from parent to offspring. Population size of any organism is limited by the resources of the environment and, in each generation, more offspring are produced than can survive and reproduce. Some individuals in each generation will survive longer and will produce more offspring than others. If enhanced survival and reproduction are caused by heritable variations, offspring that have inherited the favourable variations will also survive longer and reproduce more. Consequently, unless the environment changes to make a favourable variation neutral or disadvantageous, individuals carrying the variation will make up an increasingly high proportion of the species, ie, evolutionary change will occur. It will tend inevitably towards the accumulation of favourable changes. Selection of the variants will be brought about by environmental factors (physical and biological) acting directly on individual organisms (ie, selection is not random). 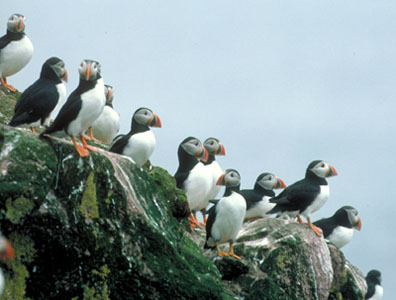 If variations do not occur to meet changing environmental demands, fewer individuals survive and reproduce, and ultimately the species will become extinct. Selection was once thought to be either "natural," leading to the longer reproductive life of the organism, or "sexual," leading to the easier attraction of mates. Physical characteristics, such as antler size or feather colouration, and some genetically patterned behaviours, were thought to have resulted from sexual selection. Sexual selection is now considered simply as natural selection. In recent years, particularly in North America, both the fact and the mechanism of evolution have come under attack by some Christian groups espousing "Creationism," the belief that Earth and its creatures were miraculously created, as is, only 6000 years ago. Creationist beliefs make no contribution to the scientific explanation of adaptation in plants and animals or of the history and diversity of life; therefore, they lack credibility in the scientific community. See also Biogeography; Social Darwinism. S.J. Gould, Ever Since Darwin (1977). No denying Nye's skewering of creationismAn article about Bill Nye’s new book which deconstructs arguments against evolution. From the Winnipeg Free Press.